Most people want to bring back a little something to remember their trip by when they visit a new destination. Shopping at craft fairs and buying wares and food made by the local artisans and vendors is not only a great way to soak up the area’s culture, it’s a fun way to find a treasured, and even tasty, souvenir. That’s what makes the great markets of Mexico so special. In Puebla, Mexico, travelers can stroll through the Parian, a popular shopping mecca with more than 100 craft vendors from around the area. Here you can buy a variety of home goods, including vases, tiles and wall hangings made from Talavera pottery. This style of pottery was introduced to Mexico in the Colonial period and was named after the 16th-century Spanish pottery center, Talavera de la Reina. When you have had enough of shopping for such amazing handcrafted items as blankets, tablecloths, bedspreads, jewelry and toys, you must take a break and enjoy servings of sweet potato sweets, as well as jamoncillos, which is a Mexican fudge that is made by cooking and stirring evaporated milk and sugar. Puebla is also known for a chocolate-based mole poblano sauce, so be sure to try, and buy, some if someone is selling. 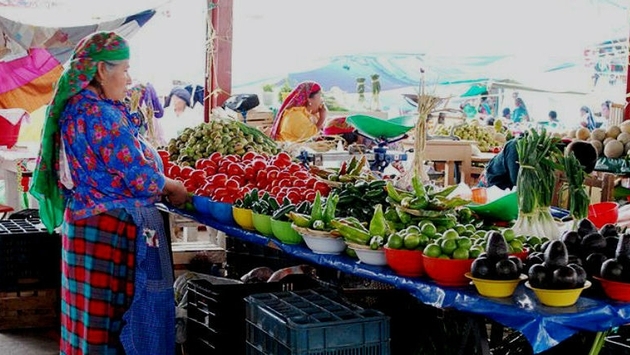 Women rule in the Isthmus of Tehuantepec, especially at the Juchitan market where there is so much food to try that your mouth will say nothing but thank you for days. These women also act as butchers, sell mescal, and prepare the tasty tlayudas, which are large, thin, and crunchy, tortillas served with refried beans, lettuce, and some sort of meat. If you have some adventure in you, you can try a very sour gooseberry, or go ahead and play it a little safer with some delicious, and sweeter, banana bread. The Juchitan market has a second floor where you can buy beautifully made costumes and dress just like the women of Isthmus. You can also purchase leather sandals, hats, dresses and more. Make sure you leave space in your suitcase to take home a hand-painted gourd. If your Mexico travels take you to Oaxaca, make sure you pack an extra pair of pants with an elastic waist to wear while you shop at the Juarez and 20 de noviembre markets. You’ll need the extra room because of all of the food that is there to sample. The smell of fresh-baked egg yolk bread will pull your taste buds in, but you should also try the mescal cream and crispy grasshoppers, a local delicacy. Chocoholics, don’t worry because Oaxaca has you covered with several chocolate shops where not only can you get your cocoa fix, you can also see the Oaxacan chocolate being made right in front of you. And last, but definitely not least in Mexico, because there are markets and vendors to visit everywhere, is a stop in Morelia, which is a cultural haven. It is also a shopper’s delight because here you can buy artwork, such as flowerpots, masks, baskets, clothing, rain sticks and pottery, made by the talented local artisans. Make sure to stop at the Cuauhnahuac Museum market for a wide selection of crafts to choose from.